The sad inevitability of life on a farm, or just raising animals in general, is that sometimes, you lose one. 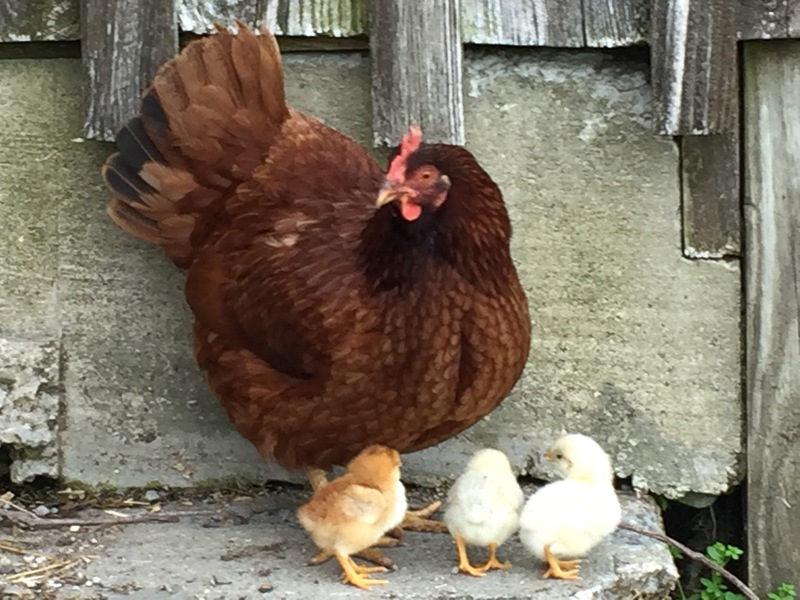 Since we began raising chicks last year, I’ve heard it said and time again. That’s why people buy them in big batches and why hens sit on big clutches of eggs. Because sometimes, you lose chicks. Little Dude and I were running late this morning. I didn’t sleep well, woke up with a migraine. Just the start of a bad day. We went to the coop and opened up the doors. The chickens came out. I could hear Claire bucking at her babies. Sounded normal. I took the treat dish, filled with feed, out to the run… And noticed Claire only had two babies following behind her. Dani, the little red one, and one of the white ones. Where was the other one? Little Dude and I searched the run and the coop, and found his lifeless body, still warm, half buried in the wood shavings. I picked him up and looked him over, there was a not-open wound on his belly. More like he’s been squashed than pecked. So… I do know what happened. Could have been pecked. Could have gotten underfoot when the big ones jumped from the roosts. I have no answers. my favorite picture of Claire and her babies. Stevie is the little white one on the very right. Good-bye, wee little one. Though we knew you only this one brief week, know that you were loved and will be missed. Oh no 😦 I’m so sorry. I hate this part of farm life!! Me too! And Little Dude is just heartbroken! A very sad day! Who knows what it could have been… An accident, I’m sure!